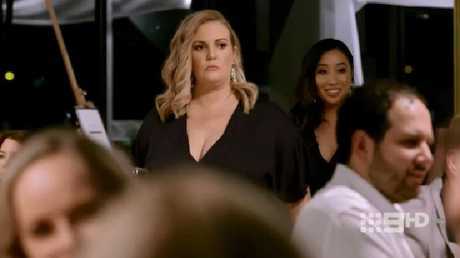 A GROUP of surly bridesmaids have co-ordinated a sting operation at the wedding of their best friend and publicly bullied her groom into prematurely exposing his secret life. And they did it all while wearing satin kaftans. "Is anything off limits?" Claire, the bridesmaid who leads the inappropriately-timed investigation, asks the bride before she embarks on her mission. With Claire granted all-access to go balls-to-the-wall, she barrels back into the wedding reception to blow this case wide open. But before we meet Monday night's couples, we check in with John and Melissa to see how they're faring after Sunday night's wedding. Weirdly, producers put all the other couples up at big fancy hotels, but it appears John and Melissa spent the night in the spare room at someone's aunt's house. They got the fancy guest sheets. First up, we meet Carly and Justin. Carly does something and Justin is an entrepreneur. "I like the finer things in life" he tells us, and that includes gross sunglasses. Then we meet Gabrielle and Nasser. She's a 45-year-old plus-sized model with alopecia. He's an oddly-confident, overly-tanned 50-year-old who runs exercise classes for old people and has the mannerisms of someone's nonna. Channel 9 is really dampening these recaps with the sad contestant backstories. Moments after we're introduced, Nasser feels he's known us long enough to invite us into his bathroom to give us a tutorial of his daily moisturising routine and it's like watching Jane Fonda in those L'Oreal ads. Looking positively dewy, he then walks around his apartment and points to everything that has been purchased from St Vinnies or found on the street during council roadside collection. Across town, Gabrielle is getting ready for her big day and her twin sister Kerrie proceeds to make it all about her. "Bad pains!" Kerrie wails while clutching her stomach as Gabrielle gets her hair and makeup done. She runs to the bathroom and makes us wait directly outside for her. When she returns, she tells us she's feeling transferred anxiety from her twin sister and it's exactly like when Jade got trapped in that collapsed house on Home & Away and her twin sister Kirsty used their twin psychic powers to locate her. When they finally make it to the wedding, everyone is in awe of Gabrielle. "She looks beautiful!" Nasser's sister gushes. "She's MY twin," Kerrie huffs, in an attempt to get the compliment extended to herself as well. Kirsty would've done the same thing on Home & Away to be honest. Up in Sydney on a random boat, Carly's totally into Justin until he starts talking about hotels no one can afford. "I always get what I want," he says, copying what I'm pretty sure is one of the Real Housewives' catchphrases. For some reason, this statement throws Carly through a loop. She runs to her bridesmaids to tell them about it and they're repulsed and start throwing the word "arrogant" around. The gals hatch a plan to interrogate Justin. Claire is tasked with leading the investigation and she treats it with the same seriousness the Navy SEALs did when capturing Bin Laden in that clay shack. Claire's on a mission and bowls back into the reception looking like she's about to flip a table. Seriously, get out of Claire’s way. Over a walkie-talkie Claire's somehow acquired on this assignment, she receives word from an anonymous source that Justin has been married before and may even have kids. There's no time to waste. She calls for backup and the ladies move in on their target. Justin's completely oblivious and - as he taps away on his phone transferring money between his accounts just for kicks - they surround him. "Is there one thing that you've wanted to tell Carly that you haven't yet?" Claire poses in a churlish manner. "Yes," Justin says, with the kind of confidence one only acquires after they've spent years telling people they're an "entrepreneur". Claire grabs a nearby lamp and holds it up to Justin's face. "Married?" she asks, staring him dead in the eye. "Yeah," his voice cracks. He realises Claire is onto him. In a final intimidation tactic, Claire smashes the lamp against the wall and grips her left hand around the underside of Justin's chin. "I do have children, yeah," Justin says through chokes. Just as he's about to beg Claire not to go after the kids, Carly approaches. Claire loosens her grip on Justin's neck and pretends to straighten his tie. She runs her fingers down his lapels and looks him in the eye. Justin turns to Carly and, with zero context, blurts out: "I HAVE TWO DAUGHTERS DOES THAT BOTHER YOU?" We all stare at Carly. Shocked, she forces a smile. But, deep in her eyes, we see her heart break. Ten seconds passes before she eventually replies. "NO NOT AT ALL!" she says in a really high-pitched voice. Claire looks at Carly with sympathy and heartbreak, even though she orchestrated this inappropriately-timed revelation in the first place. With all eyes on her, Carly holds back her tears. She'll let it all out back at the hotel in the early hours of the morning. We'll ask Nasser if he can recommend a good serum to reduce puffiness.